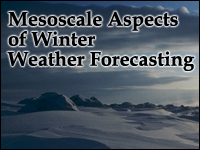 The Mesoscale Aspects of Winter Weather Forecasting effort is comprised of a growing series of in-depth case exercises bundled with supporting topics. This site provides access to the supporting topics seperate from the case exercises. July 2014: This is a collection of module lessons and cases, many remain very useful and relevant despite their 2003 publication. The learner should be aware that some of the NWP data used, especially in the case examples, may be different from the current operational NWP models. A slightly more recent collection of lessons was published in 2008: https://www.meted.ucar.edu/training_module.php?id=878.